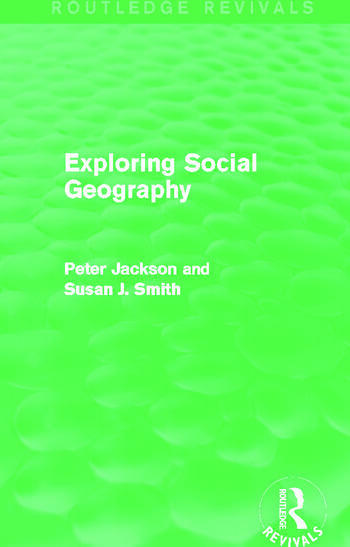 Exploring Social Geography, first published in 1984, offers a challenging yet comprehensive introduction to the wealth of empirical research and theoretical debate that has developed in response to the advent of a social approach to the subject. The argument emphasises the essentially spatial structure of social interaction, and includes a succinct discussion of geographical research on segregation and interaction, which has combined numerical analyses and qualitative ethnographic field research. A distinctive view of social geography is adopted, inspired by the Chicago school of North American pragmatism, but also incorporating the formal sociological theories of Simmel and Weber. Exploring Social Geography will be of value to students of urban geography in particular. However, it will also indicate a wide-ranging and distinctive perspective for all students of the social sciences with a special interest in debates concerning urban, ethnic, racial, anthropological and theoretical issues.